is an exceptionally efficient enzyme (high turnovers rates at low overpotentials) for producing H2 and uses cheap and readily available iron. Inspired by Nature we have synthesized organometallic catalysts with Fe2S2 cores that mimic the enzyme active site to convert transient electricity and solar energy into the storable chemical energy inherent in H2 in collaboration with Professors Lichtenberger and Evans (Purdue). Understanding the mechanism for catalysis through experimental and computational methods, is enabling us to design more effective synthetic catalysts. Electron transfer is of fundamental importance in such areas as biological redox reactions, organometals, superconductors, and photoconductors. We are interested in the factors that control electron transfer. Since sulfur is cheap, implicated in biological redox chemistry and sulfur compounds are useful in organometals, superconductors and photoconductors, it is a featured atom in our research. We have found that juxtapositioning thioethers and electron rich groups close to each other in space with the correct geometry may result in exceptional redox chemistry. To accomplish these juxtapositions conformationally constrained systems must be synthesized. Three such molecularly constrained systems, which show unusually facile oxidation are listed below. Selenium is an essential mineral and is required in small amounts in the diet of humans. However, larger amounts are toxic. A number of mammalian and bacterial proteins containing selenium, have been found and typically the selenium occurs as selenocysteine and, if the protein is an enzyme, the selenocysteine is at the active site. Selenocysteine has been found to be the 21st amino acid incorporated contranslationally. We have shown that the biosynthesis of selenocysteine involves the intermediacy of the novel monoselenophospate which is the biological selenium donor formed from ingested selenite. Identification of biological Se-containing species by Se-77 NMR spectroscopy is a powerful methodology which we are developing. Felton, G.A.N. ; Vannucci, A.K. ; Chen, J.; Lockett, L.T. ; Okumura, N.; Petro, B.J. ; Zakai, U.I. ; Evans, D.H.; Glass, R.S. ; Lichtenberger, D.L. "Hydrogen Generation from Weak Acids: Electrochemical and Computational Studies of a Diiron Hydrogenase Mimic," J. Am. Chem. Soc. 2007, 129, 12521-12530. Felton, G.A.N. ; Petro, B.J. ; Glass, R.S. ; Lichtenberger, D.L. 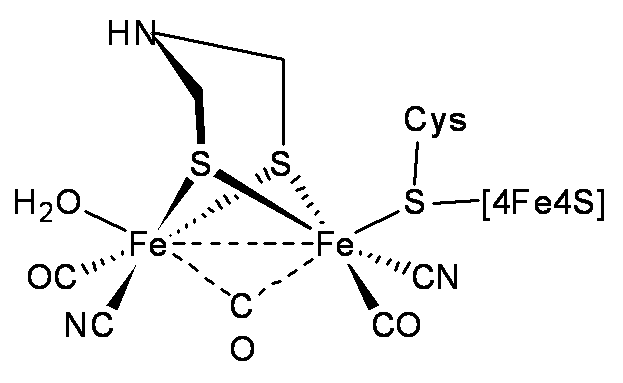 ; Evans, D.H.; "One to Two Electron Reduction of an [FeFe]-Hydrogenase Active site Mimic: The Critical Role of Fluxionality of the [2Fe2S] Core," J. Am. Chem. Soc. 2009, 113, 11290-11291. Chen, J.; Vannucci, A.K. ; Mebi, C.A. ; Okumura, N.; Borowski, S.C.; Swenson,M. ; Lockett, L.T. ; Evans, D.H.; Glass, R.S. ; Lichtenberger, D.L. "Synthesis of Diiron Hydrogenase Mimics Bearing Hydroquinone and Related Ligands. Electrochemical and Computational Studies of the Mechanism of Hydrogen Production and the Role of O-H • • • S Hydrogen Bonding," Organometallics 2010, 29, 5330-5340. Glass, R.S. ; Hug, G.L. ; Schöneich,C. ; Wilson, G.S. ; Kuznetsova, L.; Lee, T.-M.; Ammam,M. ; Lorance, E.; Nauser, T.; Nichol, G.S. ; Yamamoto, T. "Neighboring Amide Participation in Thioether Oxidation: Relevance to Biological Oxidation," J.Am.Chem.Soc. 2009, 131, 13791-13805. Chung, W.J. ; Ammam, M.; Gruhn, N.E. ; Nichol, G.S. ; Singh, W.P. ; Wilson, G.S. ; Glass, R.S. "Interactions of Arenes and Thioethers Results in Facilitated Oxidation," Org.Lett. 2009, 11, 397-400. Ammam, M.; Zakai, U.I. ; Wilson, G.S. ; Glass, R.S. "Anodic Oxidation of m-Terphenylthio-seleno-and telluroethers: Lowered Oxidation Potentials Due to Chalcogen • • • π Interactions." Pure Appl. Chem. 2010, 82, 555-563. Glass, R.S. ; Schöneich, C.; Wilson, G.S. ; Nauser, T.; Yamamoto, T.; Lorance, E.; Nichol, G.S. ; Ammam, M. "Neighboring Pyrrolidine Amide Participation in Thioether Oxidation. Methionine as a Hopping Site," Org. Lett. 2011, 13, 2837-2839. Bally, T.; Monney, N.P.-A. ; Bhagavathy, G.S. ; Glass, R.S. "Spectroscopic Evidence for a New Type of Bonding between a Thioether Radical Cation and a Phenyl Group," Org. Lett. 2013, 15, 4932-4935. Xu, X.-M.; Carlson, B.A. ; Mix, H.; Zhang, Y.; Saira, K.; Glass, R.S. ; Berry, M.J.; Gladyshev, V.N. ; Hatfield, D.L. "Biosynthesis of Selenocysteine on its tRNA in Eukaryotes," PLoS Biol., 2007, 5, 96-105. Glass, R.S. ; Berry, M.J.; Block, E.; Boakye, H.T. ; Carlson, B.A. ; Gailer, J.; George, G.N. ; Gladyshev, V.N. ; Hatfield, D.L. ; Jacobsen, N.E. ; Johnson, S.; Kahakachchi, C.; Kaminski, R.; Manley, S.A.; Mix, H.; Pickering, I.J. ; Prenner, E.J. ; Saira, K.; Skowronksa, A.; Tyson, J.F. ; Uden, P.C. ; Wu, Q.; Xu, X.-M.; Yamdagni, R.; Zhang, Y. "Insights into the Chemical Biology of Selenium," Phosphorus, Sulfur, Silicon and the Related Elements 2008, 183, 924-930. Glass, R.S. "Redox Chemistry of Sulfur, Selenium and Tellurium Compounds," in Selenium and Tellurium Chemistry, Wollins, J.D., Laitinen, R.S.Eds., Springer-Verlag, Berlin, 2011, pp 57-77.